Alison is a full time hospital doctor. She is a co-founder of both ‘Iasis’ and ‘Children on the Edge’ (of which she is Chair of trustees). A law graduate, she returned to University to study medicine, having been inspired by her early involvement in overseas projects. She has just taken up her first post as a Consultant in Emergency Medicine in Brighton. Colin is a General Practitioner and a co-founder of ‘Iasis.’ He has been involved with our projects from the beginning, when he led primary healthcare and HIV screening teams in Romania in the early 1990s. He has worked on projects in Albania, Bosnia, Kosovo, East Timor, Brazil, Ethiopia, Zambia and Canada. He has recently retired, but still works part time in his local town. He devotes much of his time to travelling to projects and fundraising for Iasis. Daragh is an ophthalmologist and public health consultant working for UnitedHealth UK. 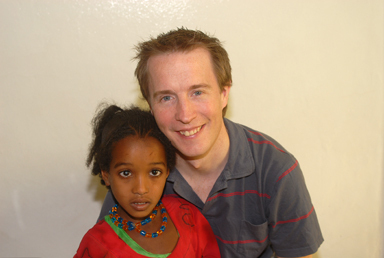 He initiated the project in Ethiopia. He is based in London and Ireland. 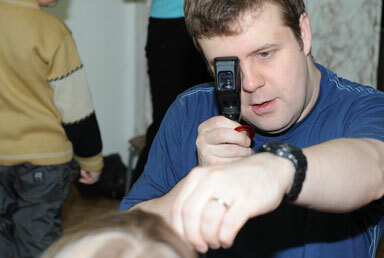 Marek is an Optometrist, with a special interest in low vision. He has worked at Moorfields and with the RNIB. He has led numerous trips to Romania, Moldova, Bosnia and Albania. He is based in London. Joy is an orthoptist, who we met while she was working at Moorfields Hospital. She has been a member of the eye team and a valued friend and supporter of Iasis for many years. She is now the Senior Orthoptist at the Sussex Eye Hospital in Brighton. Michael Crossland is a Specialist Optometrist at Moorfields Eye Hospital and a Research Fellow at the UCL Institute of Ophthalmology, both in London. His particular interest is in the rehabilitation of people with visual impairment. He has a PhD in vision rehabilitation from the University of London, is a Member of the College of Optometrists and a Fellow of the American Academy of Optometry. Michael has been involved with Iasis’ trips to Romania since 2004. How did Iasis all start? Have you and Dr Colin Tourle (Alison’s co-founder of Iasis) always worked together? Colin has been with us forever really, from the beginning. 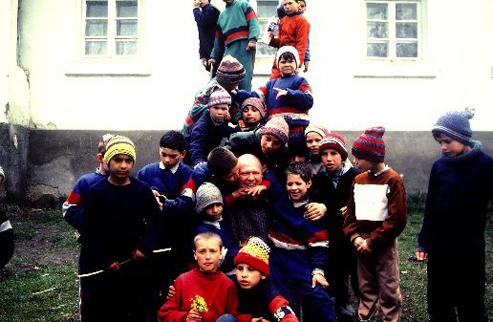 In 1990 I first went to Romania with what became Children on the Edge. Originally it was Anita Roddick’s (Founder of The Body Shop) ‘Love Team’. We travelled to the north of Romania and focused our work on three orphanages, which we chose because they were the least accessible, and the most needy, with literally hundreds of children. There were 60 children in the ‘baby orphanage’ aged between 0 and 3 years of age. When we first visited they were in a terrible state, and commonly over the winter at least two or three of them would die. The facilities were awful. There weren’t any proper bathrooms, it was cold, and the staff were not qualified to look after that number of children or to accommodate their particular needs. There was a local GP to look after their medical needs, but he was invariably drunk and not at all what you would imagine a doctor to be. It was a dire situation. At the time I wasn’t a doctor. I had just qualified with a law degree so I knew nothing about medicine but I was particularly troubled by the younger children’s medical needs. 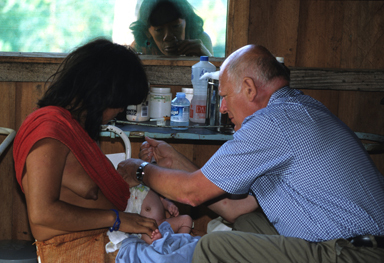 In January 1991 we recruited Dr Colin Tourle, who had worked in Africa, and with the indigenous Indians in Canada. I met Colin with Rachel Bentley (Director of Children on the Edge) in January 1991 and we sent him off to Romania to assess the healthcare situation. He was a very good doctor and a great person up for an adventure, so we thought he would be perfect. It was two years before I went to medical school and Colin was a great inspiration to me to apply to study medicine. Colin visited Romania and we decided to place a ‘care team’ in the ‘baby orphanage’ to concentrate on the needs of the younger children and the babies. This was a group of nurses from the UK who lived in the village where the orphanages were. Colin went out from time to time, to assist them, and to guide them with medical problems. He gave them advice about how to treat infections and skin problems, and how to avoid them getting really sick by putting basic hygiene programmes in place. Shortly after this, it was brought to our attention by our Romanian colleagues, that some of the children could be HIV positive because of blood transfusion and needle reuse policies during the Ceausescu years. It was in the media but we weren’t sure about the scale of the problem in the North because no one had tested any of the children. We agreed, with the Romanian authorities, to test all of the children in institutions in the Iasi region for HIV. The deal was that the Romanian scientists and doctors at the University of Iasi, would write up the project as a scientific paper so that they would get something out of it. They would learn how to do the testing and also the children with HIV would be moved to a specialist centre in the city. When this was agreed, Colin recruited a group of nurses who made several trips to Romania during the course of a year, to do blood tests on about two and a half thousand children. We went out in teams to take blood from the children and returned it to the University of Iasi. We were made welcome and our Romanian representative taught the University staff how to do the testing, and it was all carefully controlled and monitored. We failed to get blood from just one child, so tested every institutionalised child in the whole region. To fund the project Colin did a lot of local fundraising around his practice. There was local television coverage and stories in the local press. Colin and his blood testing team even made an appearance on ‘Songs of Praise’! Aside from being a great doctor, Colin is a keen photographer and a gifted speaker. Coupled with his sense of adventure, the combination of all of these skills meant that he could come back from a trip and, not only recruit people to go with him, but also promote what we were doing by raising a fan club of supporters!. That’s what he’s done ever since really, he just raises a lot of money and awareness through talking to people and showing his pictures. Things escalated from those early days and Colin has just stayed with us. Colin became inspired to form an ‘eye team’ after meeting Joy Dixon, an orthoptist working at Moorfield’s Hospital at the time. Together with optometrist Marek Karas (now an Iasis trustee), we tested all the children’s eyes, and provided them with glasses where necessary. We also arranged for some of them to have squint correction surgery. Having access into the orphanages to test their vision gave us an opportunity to monitor conditions within the orphanages, and to check the children’s health on a regular basis. After this we moved on to Albania, Bosnia, Kosovo, Moldova, East Timor, Brazil, Ethiopia…….. and he has stayed with us ever since. Now together we have formed Iasis, with the help of The Body Shop Foundation. Alison why did you become a doctor? I had always had a desire to become a doctor but when I was at school I didn’t get the required grades. I ended up going to study law instead of medicine. 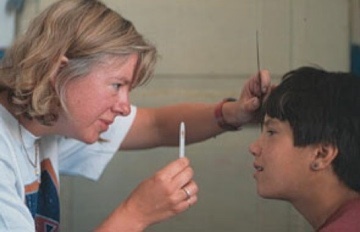 When I started working on the Romania project I was overwhelmed by the medical needs of the children. 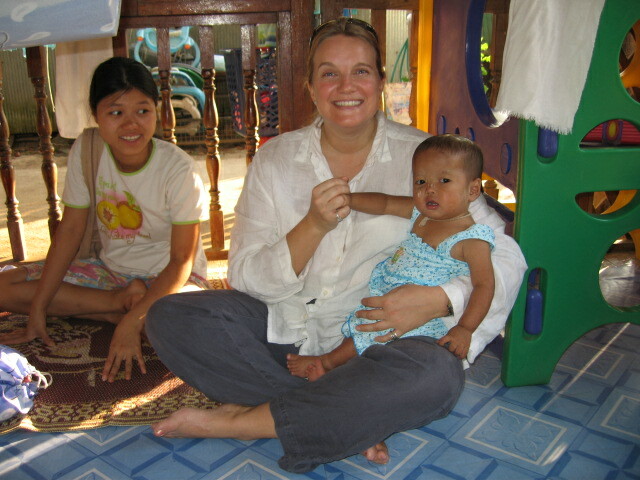 We saw a lot of babies with HIV and we a hundreds of abandoned children. I found myself drawn to the medical side of what we were doing. I felt frustrated that I wasn’t medical myself and that there was a limit to my ability to understand what was going on but also to convey my message in the countries we were working in. I wasn’t equipped and I didn’t have the status of a doctor either. I won a place at Charing Cross and Westminster Medical School in 1992. I continued working with the project in Romania while I was training to become a doctor. I eventually qualified in 1997 and just continued having a parallel life gaining more experience as a doctor in the NHS but also using my skills abroad. In terms of Medicine and the work you are doing now, what is your vision for yourself and Iasis in the future? My vision for Iasis is to develop it into a vehicle for medical personnel to share their skills with medics, nurses and patients in countries and situations where access to healthcare is limited. It’s not just about us and being able to travel – it’s about empowering other people to go out and use their skills. Having medical knowledge is like having a tool kit, with which you can go off and have a life changing personal experience. It is also a way of sharing your skills to train colleagues, or to provide medical treatment to people who wouldn’t ordinarily have access to health care. We want Iasis to bring first rate advice, training and treatment. If someone was reading our website, or reading an article about what we are doing, maybe someone in the situation that you were in 1992, trying to map a career, what advice would you give to someone else that wanted to follow that path? I think that human capacity is amazing. If you have a passion that’s burning in your heart – particularly something like being a doctor or teacher or anything that serves other people and humanity, the world is your oyster! Just go and do it. If it really burns in you, then you will be able to do it. Don’t be put off by thinking you haven’t got the brain, you haven’t got the resources, or you haven’t got the time. Although life seems short, you can change the direction of your life quite easily if you want to. That may sound a bit cheesy but if you want something in your life that is rewarding to you, that gives you a lot but also enables you to give out a lot in terms of skill, knowledge, personality, leadership and anything else then yes, I say go for it. It’s a justification for your being. It’s a reason for getting up in the morning. My other inspiration was when I first went to Albania; it was very uncomfortable for me and I wanted to get out. I got diarrhoea, I got impetigo I felt very unwell and I was really feeling sorry for myself. We stayed with a family in Tirana, the capital, and the eldest daughter was studying medicine. There was no electricity and she sat with her books, written on virtually toilet paper, because the textbooks were very difficult to get hold of. She was doing her revision by candlelight. The family had so few candles available that they gave their ration of candles to her so that she could study to become a doctor. I met her in my first year of medical school. I thought I have given up my life to do this thing and I don’t know if I am going to make it. Full of concern and probably lack of confidence, then I met her and thought if she can do it, I can. I realised just how privileged I am to have the education I have had, to have the family backing I have and to have the personal circumstances I have got which made it a whole lot easier to make that choice. Yes, the boat ‘The Spirit of Iasis’. After we had been to Kosovo we were invited to look at the situation in East Timor. We met a group of nuns who looked after the healthcare needs of a group of people on an island off the mainland. The island is called Atauro, a place where historically over the centuries, people were exiled. During the Indonesian occupation families, or parts of families were sent there to split them up and stop them causing problems. Now there are over ten thousand people on the island. There is no way of getting across the island, as it is mountainous and rugged with undergrowth and trees. You can get round the island by boat but it is expensive to own and run a boat. All they have are small dug out canoes, which are dangerous as the sea can be very rough. There were a group of nine nurses based on the island serving the healthcare needs but literally trekking out with rucksacks. If they had to evacuate somebody, because they were really ill or had a difficult pregnancy or labour, invariably the patient would just die because they couldn’t get a boat that was powerful enough to travel the nine miles to the mainland to get them to hospital. When we met these nurses we visited them by fishing boat, the nine-mile journey took us five hours. It was just a horrible seasick, slow, nasty journey. They told us that all they really needed was a simple boat that was quick enough, and sensibly designed so that they could go around the island and land on the beach, and if necessary take people back with them to the clinic. We thought it was a really good idea, but there were problems with who was going to run and fuel the boat. We agreed to take on the responsibility of running the boat in terms of fuel and repairs for three years, and the government took on the responsibility of finding local men who were knowledgeable about boats to be the crew. They paid their salaries, as a sign of commitment to show that it was something they wanted for the community. We came home and raised about twenty thousand pounds, and then had a boat made in Darwin Australia, by a boat builder who had already sent boats to East Timor for the United Nations. The boat was shipped over in 2002 from Darwin to Dilli, the capital, and then we sailed it over to the Island. We did the journey at full throttle in about forty minutes, but on average it would take an hour . The boat had a big sun shelter over the top and a flat bottom so it that it could cross the reef land on the beach. The boat had very little on it – just a steering wheel and life jackets, with a stretcher carrier in the middle and a spare stretcher. Everything was foldaway, aluminium, very light and easy to use and maintain. Initially we had quite a few problems with the boat because it was used a lot more than we had anticipated.There was supposed to be another boat in action as well, but it just kept breaking down. It was really supposed to be a mobile medical clinic going round the island, but the other boat had a lot of problems so ours became the evacuation boat. We had to repair it quite a few times. We met the Minister of Health who agreed to integrate the boat into the ambulance service of East Timor. This meant that we handed over the responsibility of the boat to the Government’s Ministry of Health. This also meant that if our boat didn’t exist any more they would be obliged to provide an alternative boat for the people. We know that we have raised the profile for the needs of the island, and also emphasised the healthcare needs of the people on the island. For the time you have been working in medicine and more so with Iasis, what would you say is the most shocking things you have seen? Definitely Romania, I haven’t seen anything more shocking than the Romanian orphanages at the beginning. We have seen a lot of poverty, which is generally shocking in all of the countries I have been to, and seen how people have managed to struggle through despite everything, but Romania was a particularly cruel situation. It was the result of an evil regime. The worst and most unlucky victims were the thousands of children who were just abandoned, not only by their parents, but also by the state. There were just too many of them to look after in an appropriate way. That’s the most shocking thing I have ever seen. With Romania now in the EU, how do you feel when you see news reports of children being tied to beds and suffering continued cruelty. I have heard it said that nothing has changed. What’s your opinion? I think that the situation has changed. I have continued to go to Romania for almost twenty years. People have, through no fault of their own, been brought up in a structure and mindset that has permeated its way through society and still does so. That’s not going to get better until a new generation of leaders are in place. I think it is hopeful, but life is still difficult for the thousands of young people who grew up within the orphanages. So the children still seem to be the victims? Yes, I think so. Anybody that is poor or lacks resources. There’s a big gap in Romania between the rich and poor and it is just getting bigger. For example the experience of seeing a friend in hospital recently, you still have to placate the doctors by giving them presents, effectively bribing them to hopefully ensure that their medical treatment is good enough. That’s complete corruption. So if you are not in the know, or don’t have the resources you are not going to get the best treatment. It’s probably controversial to say that, but that’s my experience. Things have vastly improved because there is less hidden in dark corners now. A light has shone on some very difficult situations in Romania, but there are still some hidden corners that need some light shone on them and I think that is one of them. I know you have many happy memories but are there any that stand out as awesome? There are a couple that stand out. One of them is a story from our project in Brazil. All of the tribes are very different from each other. They have had a very rough time because the loggers are very nearby undertaking de-forestation. Three years ago they lost a lot of children to chicken pox because they had no immunity to such viruses imported into the forest by the loggers. That was one of the motivations for going. When we went most of the children had pneumonia. They had an inexperienced nurse there, but she was overwhelmed by the number of sick children in her care. Most of the villages or groups of villages have a nurse, who’s Brazilian, serving the community so she could have up to 400 people in their care. She is usually based in the biggest village and then travels out to peripheral villages by dug out canoe. The nurse we met was really worried about a baby when we arrived. The baby was about ten days old, and desperately ill with pneumonia. He was pale and lifeless. We thought he could die at any moment. We hadn’t taken much medical equipment with us. We had some oral rehydration fluid which we dripped into his mouth. We found on a shelf, in a very basic pharmacy, a tray of out of date penicillin injections. They were three years out of date, and we debated whether we should use it. We had nothing to lose. We gave him injections every four hours, and told his mother to wake us up through the night.He made it through the night and in the morning he was a bit better – his eyes were open and he was crying He was still hot and breathing very quickly but definitely better. In the afternoon we managed to get a radio message out to the nearest town, and he was evacuated to the nearest hospital. The next year we returned to the village, and he was there. They had called him Aroy and he had long black, beaded hair. The parents presented him to us and said “Aroy is our Indian name it means ‘The doctors who save our lives’”. So that baby would have died without intervention? That must have been frightening especially using drugs that were so out of date, not something that would ever happen in the western world. No not at all and we wouldn’t do it either in the Western world. We thought about it and decided it was the best thing to do. It was the only thing we could do. But that stands out as an amazing experience. Another memory going back to Romania, although the situation in Romania is still difficult, seeing the children that I met when they were five six or seven years old and they are now grown up has been a very personally rewarding thing. Still being in touch with children we promised we would keep coming back to. They remember the promise and have seen it fulfilled. The memory that sticks out in my mind in Romania was when we managed to get a member of staff removed from working in an orphanage. In the afternoon they used to put all the children to bed and sometimes, in the early days, they would drug them to get them to sleep. There were often two to a bed in rickety metal beds. We had a playscheme running at the time and in one group, one of the girls had a fractured wrist. During the afternoon a male member of the orphanage staff had removed the plaster from her arm and beaten her on her broken arm. He had also pushed a pencil into her ear, and pulled her hair to the extent that it was coming out. She had a hand mark on her face where he had slapped her. This man went down the rows of beds and beat the children with a stick and with his hands if they would not sleep. We managed to get him removed from the orphanage. That was probably the first time the children had experienced real justice. In that country he lost his job, In this country he would go to prison for child abuse. How did you get involved with iasis? It all started at a Christmas party back in 1990, when I was a GP in Hailsham. I met someone who was looking for doctors and nurses to go out to Romania to medically examine the children in one of the big orphanages. There were about 100 children. I went out in March 1991 with three nurses and we slowly examined all of the children. We treated them as far as we could for all of the problems that they had. There were many problems: lots of skin problems, malnutrition – all sorts of things. That’s how it started. Did you find the images that you saw quite shocking? It was dramatic at the time. I’d never seen so many children in one place that have had such a difficult start in life. I will always remember my very first morning when I was in the orphanage. I’d heard stories about the children and wondered what they would be like. The door opened and they poured in, literally like mice. They were all over me. Four and five year olds, poured through the door and were touching me and grabbing my clothes,squeezing me and anything to make contact and get noticed. It was quite dramatic! It must have been hard trying to divide your attention between so many children, especially when they look so neglected. Your natural human reaction must have been to want to connect with them? You are right. It was difficult. There were various Romanian nurses helping me. They just sorted them out and they all had to come in one at a time and get undressed. I examined them and we very slowly worked through them. We made medical notes on all of them. What was the general state of their health at that time? Poor. They were malnourished; you could see their ribs – that shows in the photos. Their teeth were in bad condition. They had lots of skin problems – lots of things like nits, scabies, big chicken pox blisters and lots of impetigo because it’s dirty there. They had sores and crusty scabs on their skin. And there were a lot of ear and chest infections. Why did you become a doctor? What was your motivation? I was about sixteen and doing my O levels at school, but I didn’t know what to do afterwards. I was watching a western on television and one of the doctors did something heroic and spectacular. I thought that if I really tried I could probably head in that direction. I didn’t think I was going to do very well at my O levels but I was lucky because I took eight and passed them all. So I thought if I could do that then I could get my A levels. I was lucky enough to get into medical school. I went to Kings College Hospital in London. That’s the hardest bit I think, to be accepted at medical school. I can remember every minute of that interview now and fortunately they said yes and took me in. I went straight from school to Kings. What advice would you give to someone wanting to be a doctor or pursue a career in medicine? It has to be to do with liking people. The good doctors that I have met have all had an interest in their fellow human beings. Like all jobs it can be stressful. Dealing with a lot of patients can be extremely stressful at times. I think if you can get some enjoyment and some satisfaction out of trying to disentangle some of the problems that people have, it can be very rewarding. There’s no job like it in the world. What is the most shocking thing that you have experienced in your travels with iasis? We’ve had many experiences of great sadness, but I suppose the most shocking and heart-wrenching was probably the refugees in Kosovo and the stories that we heard from them. These were people that had literally been shot at and robbed only two or three days before. They were all so traumatised. That was probably the most shocking. Why was iasis in Kosovo? We’d already got a foothold in a town called Korce, which is the second biggest town in Albania, and we were helping from our base there. When the war started in Kosovo, the Kosovan refugees poured over the border into neighbouring Albania. Korce was flooded with refugees, and became the second biggest refugee camp in Albania – it had about 15,000 refugees. As we were already working there we rushed out to try and help. As doctors, our job was to go around the villages and camps and see what we could do to help. It was very much primary care – very like what we do as a GP here. We would see patients with all of the normal problems, chest infections, strokes, injuries etc. There were very few doctors in Kosovo and there weren’t many NGOs. The ones that were there we worked quite closely with were Medicine Sans Frontiers and the Spanish Medicos del Mundo, so we worked as a team with them. With Romania joining the EU, how do you feel when you see news reports of children being tied to beds and the continuing suffering? It’s been said that nothing has changed. What’s your opinion about that? That’s a difficult one to answer because I honestly don’t have any experience. The impression that I get having been there once a year or so is that things have changed a lot. What goes on that is hidden from what we see I just don’t truthfully know. We had one little insight about two years ago when we went to Hirlau – a home for the mentally infirm and physically disabled people. It was okay. Things had improved in 15 years but it was quite sad. The orphanage in Halaucesti where we used to go did have five hundred children – when I was last there it was down to about 80 or so. It is vastly smaller. With those eighty, has the care dramatically improved? I think it has. I haven’t actually been there to see it so I can’t really say. I am sure there are places in Romania where things aren’t very good. On the other hand some things are dramatically better. Especially where there has been a lot of money pumped in. I am sure there are continued problems. I think, in all fairness to the Romanians, things have changed a lot in 15 years, but they still have some way to go. Is there one particular memory that you would describe as your happiest? Saving the baby in Brazil probably. That was dramatic and if we hadn’t been there the baby would be dead. When we went to the Xingu river, Ipixuna was the name of the village. I am sure you already have the story. (Please read Dr Alison’s Interview as Colin and Alison share the same story). What was iasis doing in Albania, Bosnia and Kosovo? We went out to Albania in October 1995 and we took a paediatrician from Eastbourne. We had to visit an orphanage for the quite severely handicapped and disabled. They weren’t all children, there were some adults there and it was the most appalling place. It was dreadful: dirty, cold, horrible. There was an appalling man in charge who was supposed to be the doctor. Whether he was I don’t know. The paediatrician examined them quite thoroughly and we found one little boy called Beni. Could you tell me about Beni? Beni’s is an amazing story. When he was born he was dumped on the steps of the orphanage – just left, so nobody knows who his parents were. He had a congenitally displaced hip, so in other words his femur had slipped out of the socket of his hip bone. He couldn’t walk so they’d left him in bed for most of his life. Just left in bed in that dreadful place – can you imagine? The paediatrician examined him and we thought that it might just be possible to operate on Beni’s hip and help him. We managed to get an x-ray, not a very good one; it was rather dark and blurred, but we brought it back to Britain. It was going to cost quite a lot of money to get the ball rolling. I was the school doctor at St Bedes’ School in Hailsham, which very generously promised to help.They donated the money from the Christmas play, which paid for Beni to come over to England to be examined in Eastbourne. We had a long conversation with the surgeon and he said yes, he thought it could be done, though it was going to be a major operation. So we set about fund raising. It took the whole summer, a long time, but we raised something like £10,000. legs in plaster. St Bedes’ was very kind to him, and he stayed there during his post-operative phase. In December we took his plaster off but, sadly, he sleeve had moved. At that point we lost contact with Beni. There was a revolution in Albania, and it was another 18 months to two years before we actually found him again. The surgeon that had operated on him came up to London and we talked to a paediatric orthopaedic surgeon at Great Ormond Street Hospital. He took a team from London to Albania and operated on Beni. The results have been very good indeed! They literally cut the hipbone and made a shelf for the femur to fit in so that Beni could put weight on that leg. I saw him about two years after the operation and he looked, from the back, a bit like Meccano – but he was walking. An enormous amount of effort went in to help Beni’s hip but at the end of the day he did get a result. That was a major undertaking for iasis. The one lesson learned from that was – without doubt and which we have remembered ever since – that as a charity we can’t put all our eggs in one basket. We put a huge amount of energy and effort into Benny and he was just one child. It was a major headache. We felt that we were dragged into it. There were many problems: physically getting him out of Albania was difficult, then getting him through immigration with all the thousands of forms. In Britain, we not only had to look after Beni but he had to have a minder and a doctor from Albania with him to look after him. Can you tell me about Sarajevo? 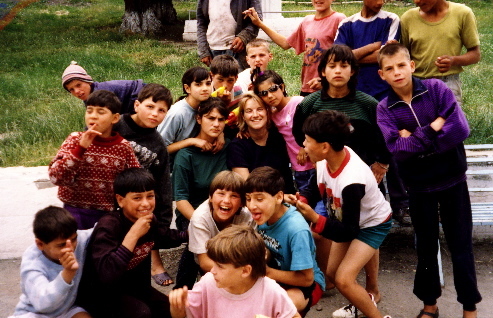 We were asked to go to Sarajevo in 1997 because Rachel Bentley (Director of Children on the Edge) had undertaken to rebuild the blind school. Iasis was responsible for equipping the blind school with visual aids and examining the children there. We took the eye team out there, on three or four visits. We raised all the money for that, mostly in Hailsham, all the equipment for the eyes, things like special lenses. That was also a very emotional time – very moving because Sarajevo had recently been besieged. Many people had been killed there and it was full of broken glass and landmines. People had horrific stories about the siege. The Serbs put a ring around Sarajevo: the Serbs were around the outside, in the hills and mountains; and the Bosnian Albanians, who were mostly Muslims, were on the inside in the town. The Serbs besieged them and cut them off from the outside world. The only way in and out was by air and that was difficult. The only planes getting in and out were NATO and UN planes. Even then the Serbs shot at them a bit. The siege went on for about four years and the blind school was right on the front line. It became a Serb outpost and they had a tank there. It was badly damaged, shelled, lots of bullet holes in it. There were mine fields all around the school, so it was really dangerous to get to the school – especially for the blind children walking up and down there. Were there any particular injuries? Did any of them stumble on a mine or were they well protected? We don’t really know. All we know is that before the war there were 300 children in the blind school and there were 70 when we visited. Nobody knows what happened to the others: they might’ve been moved or killed. That was lovely because she hadn’t seen properly before, or not since before the war, at least. We felt we’d done quite a good job in that blind school. We did a lot to get it back on its feet again. We went two or three times and they were doing very well. They were standing on their own feet and the war had finished. They were obviously going to be okay so we left them to it. At that we went in to East Timor where things were a bit more needy. Where do you see Iasis being in the future? What is your vision for Iasis as a charity? I’ve found it very worthwhile to do all of the things that we’ve done already. It’s exciting to think – and I hope we can – that we can provide assistance to other professionals that are going out to help as well. We have become part of a team with Marek and Daragh, and other health professionals so that we can help them in their own specialities to do their thing. I personally love going out as a GP doing the hands-on medical bit. Very often I can do that at the same time as something else that’s going on. I’d just love to think that we can feel our way forward, now that we have got an administrative base here that’s working well. With a bit more financial backing we could do a huge amount. We could grow enormously and do a lot of good work. It is a most exciting and lovely thing to be involved with. One of the problems we have had is our time really. We all work full time and this is a part time project. The first for me is the hands-on medicine: like in Brazil and Kosovo and East Timor, where we literally went out with our bags and got people back to health. It would be good for Iasis for a doctor to knock on our door and say, “I really want to go here” and for us to be able to say, “yes, we can help get you there”.